The Chief of Defence Staff, Gen Abayomi Olonisakin, on Thursday defended the militarisation of the just -concluded elections. Olonisakin spoke in Abuja at the ongoing orientation programme for senators- elect and members of the House of Representatives- elect. 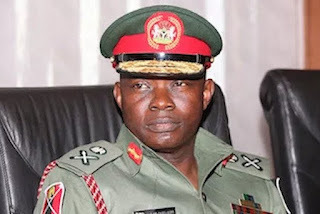 Olonisakin solicited the lawmakers ’ support for effective funding for the military if it must effectively and efficiently carry out its constitutional duties. The CDS said the military needed funds outside its budgetary allocation , noting that it was considering an alternative means of funding. Olonisakin said, “During the just -concluded 2019 general elections, the success of the electoral process was almost hampered by the security in some parts of the country. “Many crisis - prone areas were properly manned by security services to ensure that the electorate were secured enough to carry out their civic duties of electing candidates of their choices. “A critical area of support that was provided and perhaps not very visible to the public is the deployment of military logistics capabilities, especially naval and air access , to support the movement of materials across the country. “Over the years , the Armed Forces of Nigeria have built various capacities to enable them to perform our various goals.